BabyNaturopathics.com - Organic Cotton Infant Bib By Baby Naturopathics - Baby Naturopathics Inc.
Our baby bibs are larger than regular bibs, providing more protection from mealtime messes. 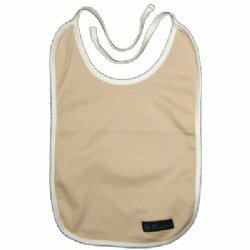 Bibs are bordered in natural colored organic cotton. Tie closures are also of natural organic cotton. Available in five attractive colours. Certified organic by SKAL International.